Core Supplement Kit: Your Favorite Nutritional Supplements In One Handy Pack. Getting in all your vitamins and minerals just got a lot easier! This is a convenient and cost-effective solution to incorporate additional vitamins, minerals, and nutrients into your daily routine. Furthermore, your vitamins and minerals just got a lot easier. Now, you can get all your favorite natural nutritional supplements in one handy pack! The (30 Day) Core Supplement Kit makes it easy to add natural vitamins and minerals to your daily health routine. Young Living offers all your favorite essential supplements in one complete pack. One to take with breakfast, lunch, and dinner. There’s no easier way to guarantee a well-balanced diet! Life 9: Take 1 capsule every night following a meal or as needed. Longevity 30 Softgels: Take 1 soft gel capsule once daily with food or as needed. OmegaGize³: Take 4 capsules daily, 2/am and 2/pm for daily maintenance. Take 8 capsules for greater health benefits. 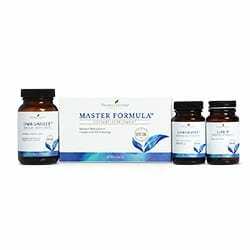 Master Formula: Take one packet daily with water or with 1-2 fl oz. of NingXia Red®.